With Halloween around the corner, you may be making Halloween printables, party cards, party favor bags and tags, decorative Halloween signs, Halloween banners, and Halloween crafts and you want to make them extra spooky looking. 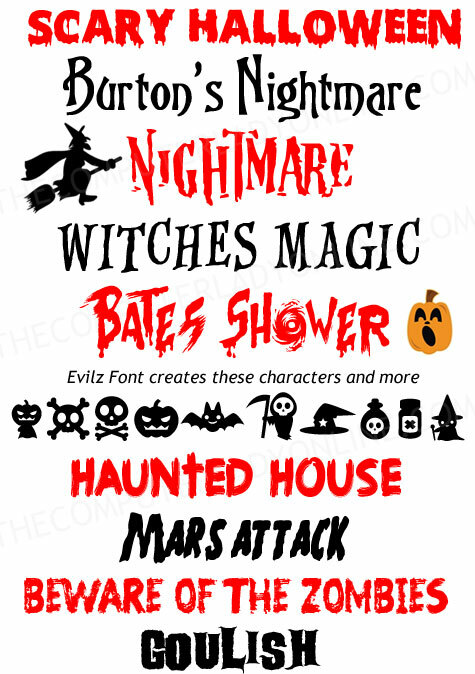 Here are some of my favorite spooky Halloween fonts for all of your Halloween projects. Looking for Free Christmas fonts? We have a list of those too. You may have to close any programs like Word or Photoshop that you have open. Once you install the fonts you can reopen the application and you will see the fonts in the fonts list. However, some newer programs don’t require you do close them for the fonts to be installed. Click next to “Open With” and click OK. When the window appears, double-click on the .TTF or .OTF file. If there are other files, just ignore them. Click Install. Wait and close all windows. If there are other .TTF files in the window in step 3, install each one. Click Download from the font website and save the font folder to your computer. In the Finder, open the folder or disk that contains the fonts you want to install. Select the font suitcases for the fonts you want to install. For PostScript Type 1 fonts, select the printer outline files as well. Drag and drop the fonts into the Fonts folder in the Library folder.